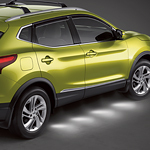 Are you looking for a compact crossover? At Gregoris Nissan, our team works diligently to keep our consumers well-informed about our models. The Nissan Rogue Sport is a popular compact crossover that provides drivers with a number of performance features that you can read about below. The Rogue Sport offers numerous driver-assist technologies that include Hill Start Assist, Intelligent Trace Control, and Intelligent Engine Braking. When you are driving on an incline, Hill Start Assist can hold the Rouge Sport in place while you transition from the brake to the accelerator. Intelligent Trace Control will adjust the braking to each wheel to help you precisely get around curves, and Intelligent Engine Brake offers smooth deceleration while you are driving in busy city traffic. The XTRONIC Continuously Variable Transmission will automatically adjust so that you maintain the best gear for maximum efficiency, and available ProPilot Assist will help you stay in your lane and maintain a safe driving distance from the vehicle ahead.